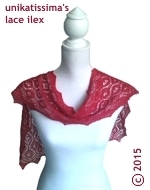 This year you can knit on the 24 days of Advent a scarf shawl that is symmetrically patterned in length and width. If you look carefully you can see that the medaillons have different patterned center patterns that I arranged symmetrically. 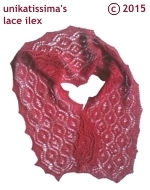 The shawl has a zigzag seed stitch border around the whole shawl and a narrow pattern repeat which allows you to knit it as narrow (= scarf) or wide (= shawl) as you like. You will also be able to adapt the length because there will be a lengthening pattern in the middle to lengthen the shawl should you need to. The picture only gives an idea of what you will knit but (hopefully ;-)) not spoil the surprise. 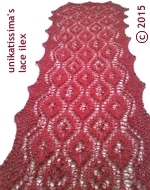 a lengthening pattern that you can insert in the middle of the shawl several times to adapt the length of the shawl to your liking. 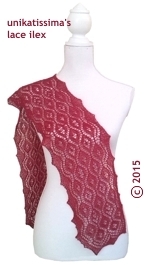 The shawl looks best if you knit the lengthening pattern at least once. 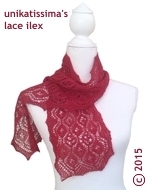 the lengthening pattern has 24 rows and will be inserted on day 12. I always knit rather loosely. This year I only managed to knit one scarf shawl. got a scarf shawl of about 18 x 118 cm/7" x 46". I knitted the respective daily pattern parts in about 30 min. your scarf is very nice. I think its pattern is unique . shall have the pattern to knit it ? I can not find it in your above explanation . Because this is this year’s Advent calender, from Dec 1, 2015 to Dec 24, 2015 one part of the pattern will be published here on this site every day as the daily instruction. Do you post the daily patterns at the same time each day? If so, what time? Thank you! yes, they will be posted every day at the same time. But I don’t know yet at what time they will open, because I don’t know what ‘clock’ the system uses. I think it will be at midnight here (which seems to be UTC+01:00 (CET)). Will you post a compacted pattern at the end? I’ve been saving the posts, but it’s going to be a pretty big document at the end. I’d like to have it a bit shorter when all is said and done. Have a wonderful Advent time! Thank you so very much for this pattern. I have enjoyed every day of it. I wish you and all those knitting along the Blessings of this Holiday.